There are many major sight-seeing spots in “Kansai”. In particular Osaka and Hyogo are popular because there are plenty of places for amusements and gastronomy. Around this area you find various historical edifices and streets still retaining good old ambience. In this issue we introduce events in Osaka and Hyogo, which would make your trip more fruitful. “Osaka Tenman-gu” located in “Tenman” area close to “Osaka” Station, is a shrine where a deity of academia and arts is enshrined, and is worshipped by local people and Osaka merchants. The locals familiarly call it “Tenma no Tenjin-san”. During the first 3 days of the New Year around 500 thousand people visit there for worship. 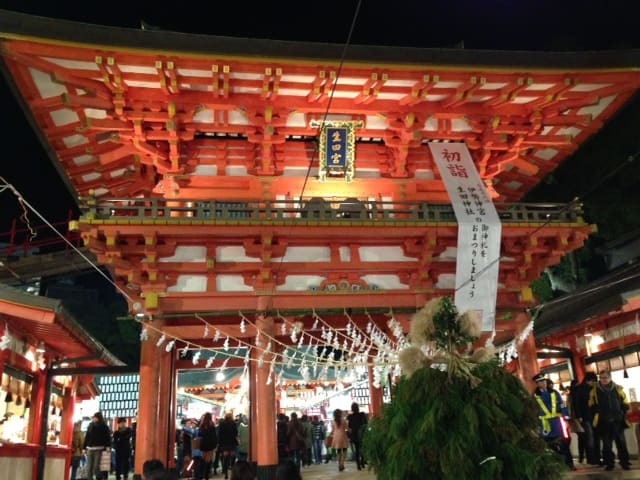 In the New Year many people gather for “Shinshun Hatsu-Kagura Hono” (New Year dances dedicated to the deity) and “Shinshun Kakizome Taikai” (a New Year’s calligraphy) participated by children up to senior high students. Nearby there are “Osaka Museum of Housing and Living” which displays transitions of the streets and life-style of people in Osaka, and a shopping street called “Tenjin-bashi-suji Shotengai”, the longest shopping street in Japan and good for a 40 minutes stroll. You will have a quick glance at the local life. “Shinshun Kakizome Taikai”: 10:00a.m. – 03:00p.m. “Sumiyoshi Taisha” Shrine is the head quarters of the 2000 “Sumiyoshi” Shrines in Japan and one of the three major Sumiyoshis in Japan, along with the ones in “Shimonoseki” and “Hakata”. Here in Osaka it is familiarly called “Sumi Yossan”. The main buildings are designated as National Treasure Building. In the precinct there is a beautiful bridge commonly called “Taiko-bashi”. It is said that the bridge is designed to represent a rainbow bridge connecting the heaven and the earth. “Sumiyoshi-taisha” brings you good luck, warding off evil, happy marriage, success in business, easy childbirth, etc. There are events during the New Year namely “Wakamizu-no-gi” (scooping holy water) early in the morning on the New Year, “Sumiyoshi Odori” (a dance of Sumiyoshi designated as Intangible Cultural Property) during 3 days in the New Year, “Toka Shinji” (a dance dedicated to a deity for abundant harvest) on the 4th January, “Ao-uma Shinji” (a ritual of a white horse), etc. It is a must-see event. 30 minutes by train from “Osaka” Station visa “Osaka Kanjo” Line or Nankai Honsen Line. “Imamiya Ebisu Jinja” Shrine is located in “Osaka”, a city prospered as the center of commerce. 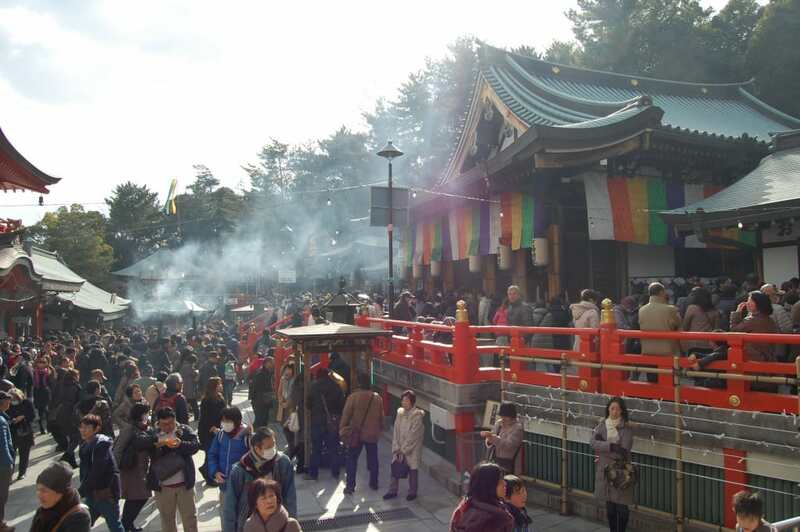 There is an event at this shrine called “Toka Ebisu” where around one million people visit every year. They wish prosperous business and happiness for the year. In the morning on the 7th, Shinto rituals called “Mochi-tsuki” (pounding boiled rice into rice cakes) and “Mochi-maki” (scattering rice cakes to a crowd) are held. In the morning on the 10th there is a market to sell “Tai” fish (a sea bream, auspicious fish for Japanese people). Around the noon on the same day, you can see a parade called “Hoe Kago Gyoretsu” where celebrities ride on small carriages. 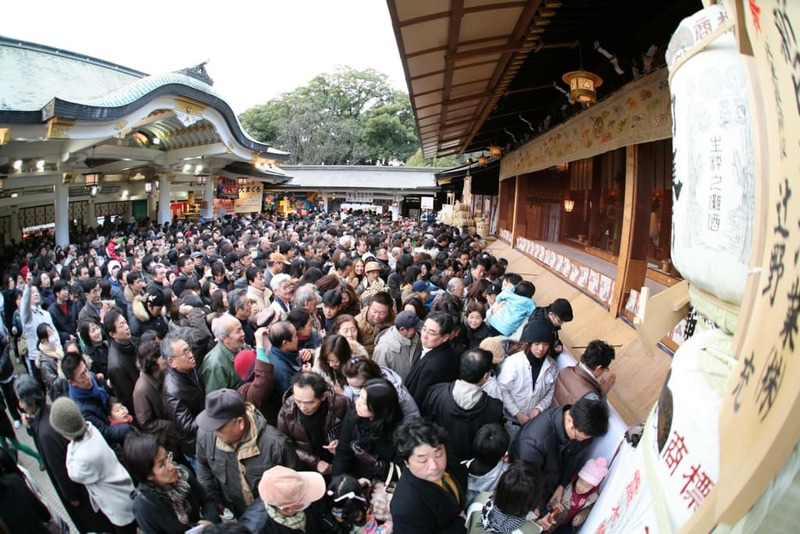 The shrine is very crowded with visitors for “Hatsu-moude” praying for prosperity. They buy “Kodakara Kiccho” (lucky ornaments) decorated with bamboo leaves. In the neighborhood there is “Shin Sekai” district which includes “Tsutenkaku” Tower, a symbol of Osaka, “Jan-jan Yokocho” (shopping street), etc. “Ikuta Jinja” Shrine is located at “San-no-miya” area of Kobe. Though its location is in the middle of Kobe-city, the precinct is very greenery and looks like as oasis in the city. The shrine has a history of more than 1000 years. It is said that the name of “Kobe” derived from “Kanbe” meaning “a house protecting the god of “Ikuta”. The shrine brings you good health, happy marriage, and various other good things. 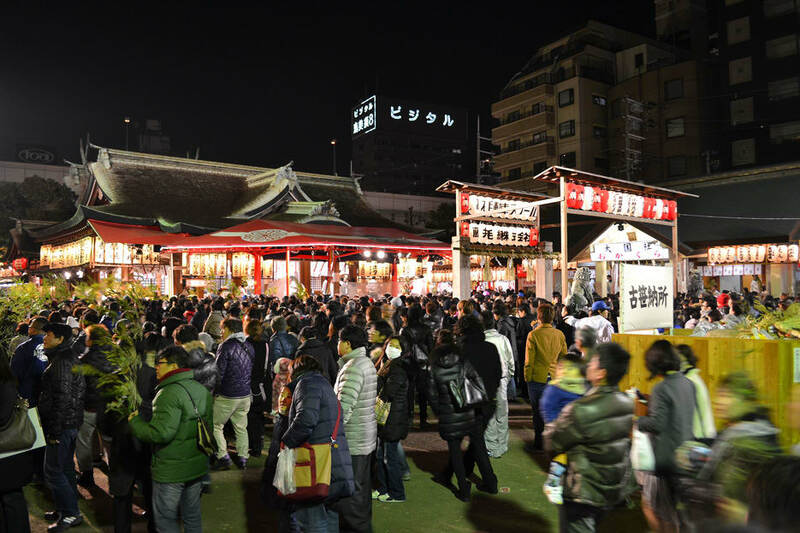 During the first 3 days of the New Year, around 1.5 million people visit the shrine. “Ikuta” anciently meant a vivid place and therefore many athletes and artist visit there for blessings, as well. “Toka Ebisu” is a seasonal event for the New Year. It is a festive event to pray for good fortune visited by more than one million people. On the 8th a big tuna fish is dedicated to the deity by young venders with vigorous shouting. On the 9th “Kento-shiki” (dedication of hot spring water) by “Geisha” and “Yoimiya-sai” (an eve festival) are held. At midnight on the 10th, all the gates of the shrine will be closed. It is called “Igomori” where people purify their bodies and wait in silence for “Toka Ebisu Taisai” (a main festival) to commence at 4 o’clock in the morning. 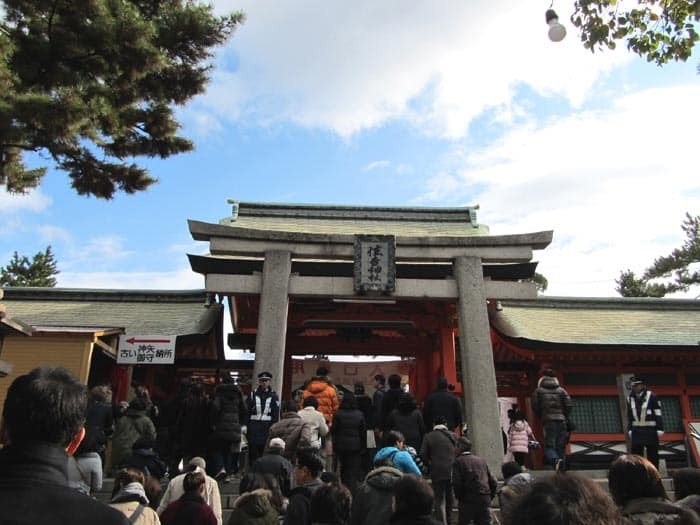 At 6:00a.m., the main gate of shrine will be open after the main festival and the annual ritual of “Kaimon Shinji Fuku-otoko Erabi” (a selection of the luckiest man for the year) commences. This event is so popular that it is aired on the TV every year. During the period from “Hon Ebisu” on the 10th to “Nokori-fuku” on the 11th, many people visit the shrine to make a wish for good fortune. In and around the precinct of 39,700m2, there are 600 shops and stalls for “Kiccho” (lucky ornaments) as well as other items. Why not enjoy the festivity? It is believed that “Yakujin Myoo” (a guarding deity) wards off all kinds of misfortune. This “Myoo” is enshrined at “Mondo Yakujin Toko-ji” Temple located in Nishinomiya-city, Hyogo, and is well known for the merits of warding off misfortunes. Not only in Hyogo and Osaka, but it is famous also in Kansai region citing “The warding off misfortune means ‘Mondo Yakujin’”. Though 19th day of every month is a day of fete of the temple, 18th and 19th January are the most important days for “Hatsu Yakujin” (the first warding for the year). It is the annual tradition of the New Year. A few thousand people visit to pray for a happy life without any misfortunes. There is a big crowd and many stalls to attract the visitors. Nearby there is also “Fukutokujin Nishinomiya Jinja” Shrine familiarly called “Nishinomiya-no Ebisu-san”. Why not visit both? 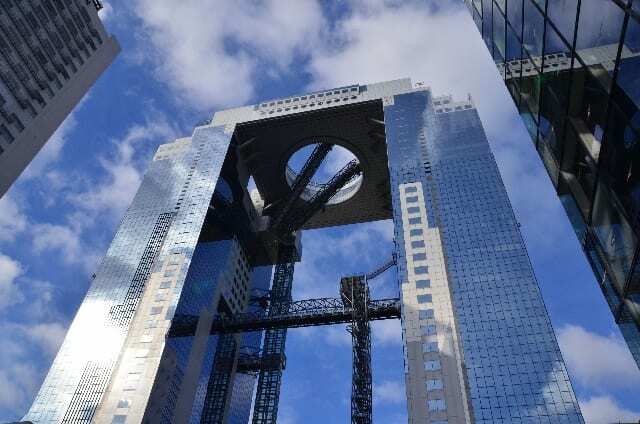 “Umeda Sky Bldg” which is 173m high, is located in “Shin Umeda City”. A see-through elevator and escalator will take you to the observatory of “Ku-chu Teien” (the Hanging Garden). It is an open-air garden on top of the skyscraper where you can enjoy a fresh breeze and a spectacular panorama of 360 degree and you can see Osaka, Kobe and as far as “Awaji-shima” Island. Since it is listed on “the 100 best night views” and “the 100 best sun-set views in Japan”, it is a popular spot for local and foreign visitors. At the event “the Sunrise on New Year’s Day” at “Ku-chu Teien” you can see the sun rising out of Mt. Ikoma. A sunset which colors the sky scrapers in orange is breathtaking as well. Why not enjoy the dawn of first sunrise of the year at “Ku-chu Teien”? . You can reach the observation deck of “Sky View”, Kansai Airport in a few minutes by shuttle bus from the platform No.1 on the first floor in the passenger terminal building. The observation deck is on the 4th and 5th floor. You can watch take-offs and touch-down very closely. It is so close to the run-way that you feel as if the planes flying just overhead. The view is one of the best in Japan. You can also enjoy a spectacular night view because it is open till 10:00p.m. On the New Year’s Day the observatory is open at 04:00a.m. 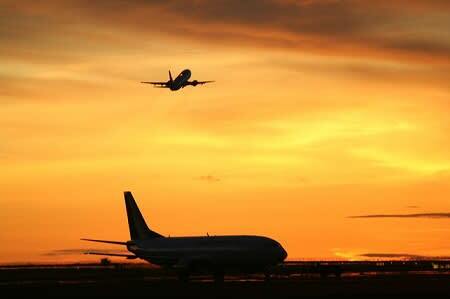 It will be a rare chance that you can watch the first sunrise of the year at Kansai Airport. There are facilities at the Sky Deck such as Sky Museum where you can experience the various aspects of the airport, a restaurant “Legend of Concord” where you can taste in-flight meals, and Sky Shop Town where you can buy items of airlines. Why not grab this chance? 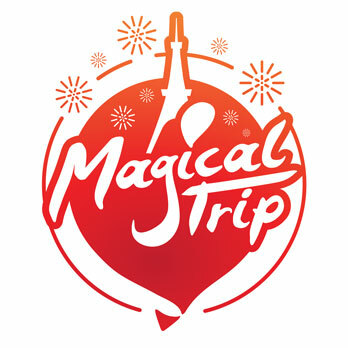 5 minutes by shuttle bus (free) from “Kansai Kuko” Station, JR “Kansai Kuko” Line or “Nankai Kuko” Line. Take the bus for “Tenbo Hall” and get off at “Tenbo Hall”. 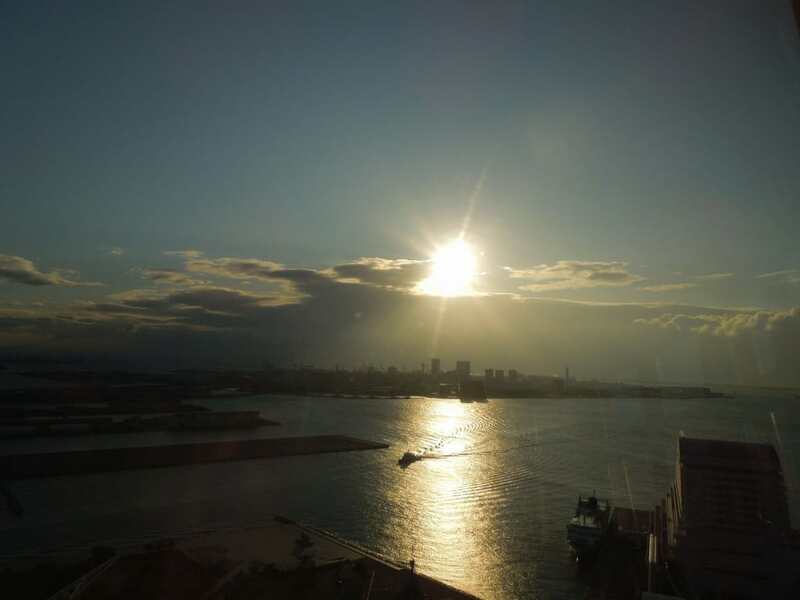 The “Kobe Port Tower” has a history of more than 50 years and is a landmark of the Port City “Kobe”. Because of its elegant shape the tower is familiarly called “Steel Tower Beauty” and loved by the locals and tourists as well. During the daytime its red painted color and at night colorful illuminations accentuate in Kobe. It has 5 layers of observatory on top and 3 stories on the ground. There are an entry-free area and paid area. On the New Year day, an event to view the first sunrise is held. The tower is open at 6:30a.m. The first 150 visitors will receive some souvenir. Since there are a sky lounge, restaurant and souvenir shop, families and couples can have a good time in the tower. Why not enjoy the first sunrise on the New Year Day? The Osaka International Women’s marathon starts and finishes at Yanmar Nagai Stadium and runs through the most scenic and historic areas of Osaka such as “Osaka-jo Koen” Park and “Modosuji” Street. 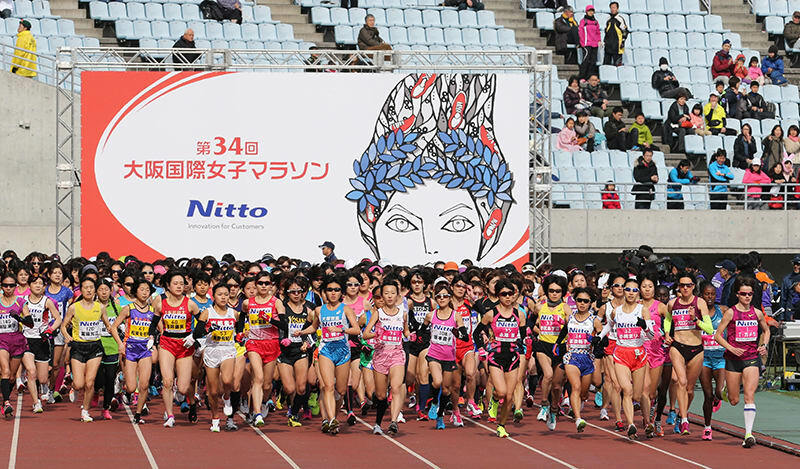 The course is authorized by IAAF (International Association of Athletics Federations) and this race is a part of the Marathon Grand Championship Series where runners for the Olympic in Tokyo in 2020 will be selected. Promising runners will compete in a thrilling race. Unfortunately the entry for the race is closed, but you can still watch the race. Since there are many scenic spots in the course, it will be nice to cheer the runners while sight-seeing. Not only your cheering would give them a big boost to the runners but you will also be watching the future Olympic runners closely. Isn’t it nice?